HS Invoice Manager is an easy to use invoicing, billing and accounting software for Windows 7, XP and Vista for small to medium size businesses. Create professional invoices, credit notes and quotations in minutes! Invoice manager is easy to use, HS Invoice Manager helps you boost your business image with professionally looking invoices and makes your business more efficient by allowing you to email invoices. 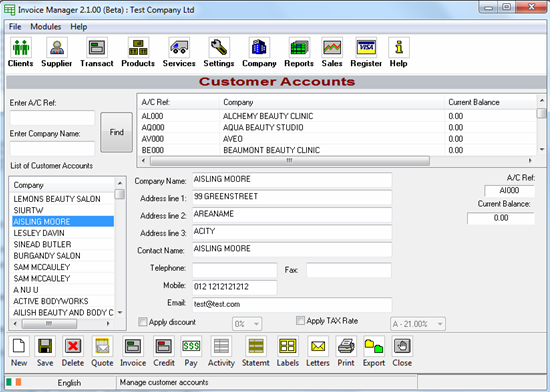 HS Invoice Manager is an easy to use invoicing, billing and accounting software. - Product stock reduced as invoices are issued. Qweas is providing links to HS Invoice Manager 2.1.26 as a courtesy, and makes no representations regarding HS Invoice Manager or any other applications or any information related thereto. Any questions, complaints or claims regarding this application HS Invoice Manager 2.1.26 must be directed to the appropriate software vendor. You may click the publisher link of HS Invoice Manager on the top of this page to get more details about the vendor.